I wanted to make a festive and delicious meat-free recipe. I’ve been thinking about how my family loves to eat beef Wellington during the festivities of winter and I decided to make a vegetarian one. It came out quite delightful—everybody loved it. 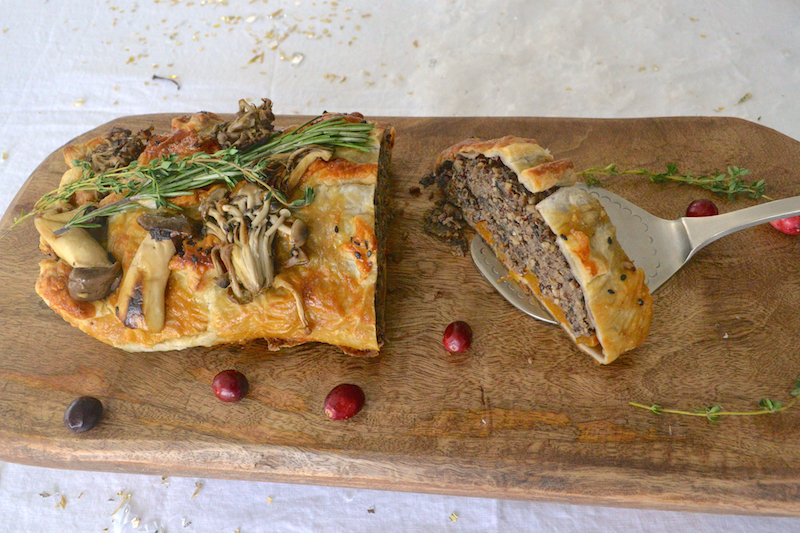 Even the meat lovers fell in love with this vegetarian wellington. The recipe uses the base of the recipe for my vegetarian thanksgiving turkey. Instead of the gravy and the stuffing, I’ve added in butternut squash. I added a simple sauté of mushrooms over the top and decorated it with rosemary and thyme. I use Duffor classic puff pastry which I strongly recommend; the taste and texture are wonderful. It’s a recipe that I will continue making in different ways because it works. It is always great, delicious, and impressive. Don’t let the number of ingredients deter you — it is worth it. Bake the chopped butternut squash with a splash of olive oil and seasoned with coarse sea salt and pepper. When it’s done, set it aside. Grind the nuts for the loaf very finely in the food processor and set aside. Pulse the rice in the food processor a few times. In a sauté pan over medium heat, heat 1/4 cup plus 1 tablespoon olive oil and sauté the onion and minced garlic. Add the bay leaves, the chopped rosemary, sage, and thyme, and set aside. Remove the bay leaves. In a sauté pan over medium high, heat 2 tablespoons olive oil. Once the pan is hot, throw in the chopped mushrooms and sauté until tender. Add 3 tablespoons of porto and let it simmer until most of the porto has evaporated. Remove from the heat and mix with the ground chestnuts, the cup of cooked quinoa, and the cup of cooked red rice in a large bowl. Add the ground walnuts. Incorporate the reserved sautéed onions, the Worcestershire sauce, and salt and pepper to taste. Mix everything together well, along with the beaten eggs and set aside. On parchment paper, roll out the puff pastry onto a rectangle. Spread the butternut squash in an even layer in the middle of the pastry. Top with the mushroom mixture in an even layer. Compress with your hands to form a solid block of both mixtures. Bring all the sides of the pastry together and seal it well. Fold the ends, tucking them in. To cover the seam, you may twist some leftover pastry into a decorative strip. Brush the pastry all over with the beaten egg and bake for about 30 minutes or until golden brown. Leave to settle for about 15 minutes before slicing. Decorate with a simple sauté of whole mushrooms and rosemary sprigs, if desired.